The Edinburgh Futures Institute will move into its permanent home in the Old Royal Infirmary. The redeveloped building will provide 21,300 m² of floor space, 6000 of which will be new construction. The development will create a highly connected range of diverse accommodation: teaching and event spaces, major lecture halls, meeting rooms, and IT hubs. The project will restore and connect six historically significant Nightingale wards and make use of the building’s unusually wide corridors to create space for informal encounters and break-out areas. Below the new public piazza, the development will create a generous multi-functional space for events and major lectures. The new building will be accessible to staff, students and the general public, ensuring it lives up to the motto inscribed in stone on the building’s wall: “Patet Omnibus”. It means “Open to All”. Building work begins on the Category A-listed building to sensitively restore, extend and upgrade it as the home of the Edinburgh Futures Institute. The revitalised building will transform the local area, creating a major public piazza, new garden spaces, and several new points of access from Lauriston Place, Middle Meadow Walk and Quartermile. Rab Bennetts, Founding Director of architect Bennetts Associates, said: “Transforming the Category A listed Royal Infirmary into the University of Edinburgh’s new interdisciplinary quarter is one of those projects that comes up once in a lifetime. The building is one of the top ten listed buildings in the city with enormous potential for renovation. It is decided that the Victorian building was no longer suitable to cater for the demands of a modern hospital. The then Scottish Secretary Donald Dewar signed an agreement to build a brand new Royal Infirmary at Little France, in the south-east of Edinburgh. The move of all hospital operations from Lauriston Place was finally completed in 2003. The Infirmary opened on Lauriston Place and was described as “probably the best planned hospital” in Britain. Beneath an imposing clock tower, the walls of the marble entrance hall were lined with wood panels listing the new hospital’s benefactors. Generations of students from the University’s Medical School trained at the Royal Infirmary over the subsequent century. 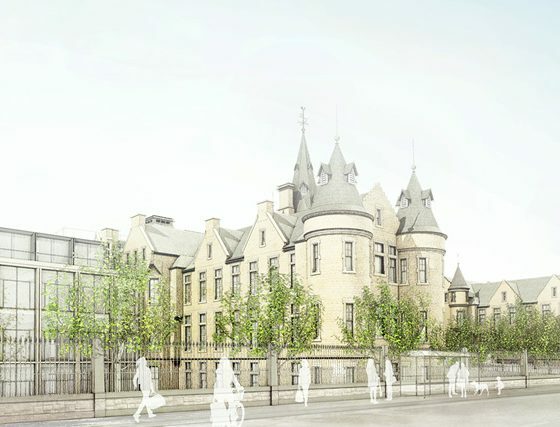 Architect David Bryce, famed for his Scots Baronial style seen in his work at the city’s Fettes College and the Bank of Scotland headquarters, was asked to design a new Royal Infirmary. His plans were greatly influenced by the ‘pavilion’ model developed by nursing pioneer, Florence Nightingale. Each ward was three stories tall with large windows. The rationale was that the increased space and light improved ventilation and reduced mortality rates. The first Royal Infirmary was based in the ‘Little House’ at the head of Robertson’s Close in Edinburgh’s Old Town. The hospital was funded by the public after an appeal by the Royal College of Physicians of Edinburgh. The hospital was widely welcomed, but its facilities were inadequate. There were only four beds.